"Hypo" means under, a hypodermic syringe delivers liquid under the dermis (the skin) a hypoallergenic pillow is less likely to cause an allergic reaction, "therm" refers to temperature. Normal human core body temperature is 37°C (98.6°F), clinical hypothermia occurs when the core temperature falls below 35°C (95°F) - that's not much of a drop. If someone is exposed to cold and inadequately protected, their body will first try to generate more heat through shivering to maintain a normal temperature. If the body can't stay warm by these means, it will start trying to decrease heat loss by decreasing blood flow to the extremities to minimize cooling. Finally, if the loss of heat carries on despite these measures, the body will slow its metabolism to minimize its need for fresh blood flow and oxygen supply. If it is inevitable, then the sooner the body reaches the final step, the better chance of survival so that the organs won't become starved of oxygen. For example, a core temperature of 20°C (68°F) requires only 20% of the oxygen required at normal body temperature of 37°C (98.6°F). This results in symptoms such as shivering, numb hands and other extremities and reduced manual dexterity. Complex skills such as skiing become more difficult, the victim may also feel tired and may argue and become uncooperative. The beginnings of hypothermia are notoriously difficult for the victim to spot themselves, they will often be strongly denied. Difficulty in performing tasks such as fastening up clothing, putting on gloves, a hat etc. or taking them out of a rucksack may result in the victim getting irritated and ending up not bothering. This will of course make them get even colder. A fall in core temperature of only 1°C can slow reaction times and impair judgment leading to poor decisions. In this stage the body has effectively stopped trying to keep itself warm and some final steps are taken to avoid death. The heart rate and breathing slow so that they are hard to detect at all. Only one or two breaths per minute may be taken. The skin is very pale and icy cold to the touch. The limbs are stiff, the pupils of the eyes dilate (open wide) and are unreactive to light. To all intents and purposes the person appears to be dead. Metabolism has slowed so far that they are almost in a state of hibernation. At a core temperature of around 28°C (82.4°F) heartbeat irregularities may occur - called cardiac arrhythmias - this can lead to an uncoordinated twitching of the heart muscle preventing it from pumping blood properly and so resulting in death. Even if this does not happen, the heart will stop beating completely at around 20°C (64.8°F) causing death. 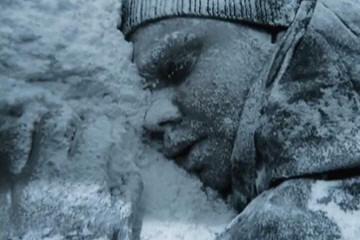 Reports of people who have died or come close to death with hypothermia describe them as becoming colder and increasingly numb, then drifting slowly off into oblivion. Some are described as having hallucinations before becoming unconscious, others of becoming "giggly" and regressing to a child-like state. Every year there are tales of people surviving cold ordeals that had apparently killed them, in fact even as far as being declared clinically dead. Children in particular can survive the effects of hypothermia successfully. The reason for this somewhat ironically is the increased surface area to body volume ratio (less body under the skin) that causes the child to cool down more rapidly and means that the body enters the more stable 3rd stage of profound hypothermia sooner. Children's organs are easier to bring back to life as they are less likely to be affected by any kind of stress or disease that may may affect older organs. Even so, successful stories of survival are rare, it's just that we get to hear about them as they make the news, once ice starts to form in the body, it kills all of the cells that it touches. Any "miracle" or "magic" is more to do with the person being found in time, recovery is just a matter of physics and biology. EDMONTON (Canada) Sunday, Feb 25th, 2001 - A doctor who helped bring a toddler back to life after she wandered outside in bone-numbing weather says there was a magical element to the girl's recovery. Dr. Allan De Caen recalled Monday how a medical team at the Stollery Children's Hospital went into action to revive the 13-month-old whose heart had stopped for two hours before dawn on Saturday. A toddler who wandered outside in her diaper in sub-zero weather and was found virtually frozen face down in the snow appears to have survived the ordeal without brain damage, says her doctor. The 13-month-old girl is recovering at the paediatric intensive care unit at University of Alberta Hospital in Edmonton. As the child arrived by ambulance, the team began setting up a heart and lung machine - to help warm her body. But before they could start running the machine, the baby's heart started beating on its own. The pediatric intensive care specialist said "Sometimes it takes something beyond just the personnel and the equipment, I don't know whether you talk about it as a greater being or whatever your personal beliefs are, clearly something or someone was on this little girl's side." She was looking around her hospital room and smiling. He said her frostbite injuries are extensive and it will take weeks or months before doctors know what the outcome of those will be. Her brain function appears to be normal, although it will require close monitoring as she grows up, he added. No one knows how long she had been outside in the -20 C weather clad only in her diaper. Her mother woke up about 3 a.m. Saturday and realized the girl was not in bed with her. She found the baby curled up in the snow in the backyard. The mom and little girl had slept that night at a friend's house. The child's toes were frozen together and her mouth was frozen shut. Her body temperature was 16 C instead of the body's normal temperature of 37 C.
Luckily, she was found in time, and prospects for her future look good. In peacetime, people rarely suffer the severe consequences of cold injury when going about their everyday lives. Those incidents that do occur are usually a result of a natural disaster that destroys housing and infrastructure such as an earthquake. Accidents occur of course and people or vehicles sometimes fall into icy waters, get caught up in an avalanche or people get stranded in their vehicles in a snow or ice storm without food or warm clothing. During war time however, cold has sometimes had a disastrous effect on many otherwise well planned military campaigns. One of the earliest recorded and most famous cold-inflicted blows was against the Carthaginian general Hannibal in 218 BC. He set off with his famous forty war elephants, but also with 12,000 cavalry and 90,000 infantry to march across the Alps through the Mont Cenis Pass to northern Italy. While this is portrayed as a great success, only about half of this army survived the march, the rest died from exposure along the way. Though Hannibal was initially successful with some spectacular victories in the countryside, he ultimately couldn't march on Rome due to insufficient numbers. Eventually Carthage fell and Rome was victorious. Russia's winter has famously had a history-making part to play in wars. At the height of his military powers in 1812, Napoleon marched on Moscow with an army of more than half a million men. 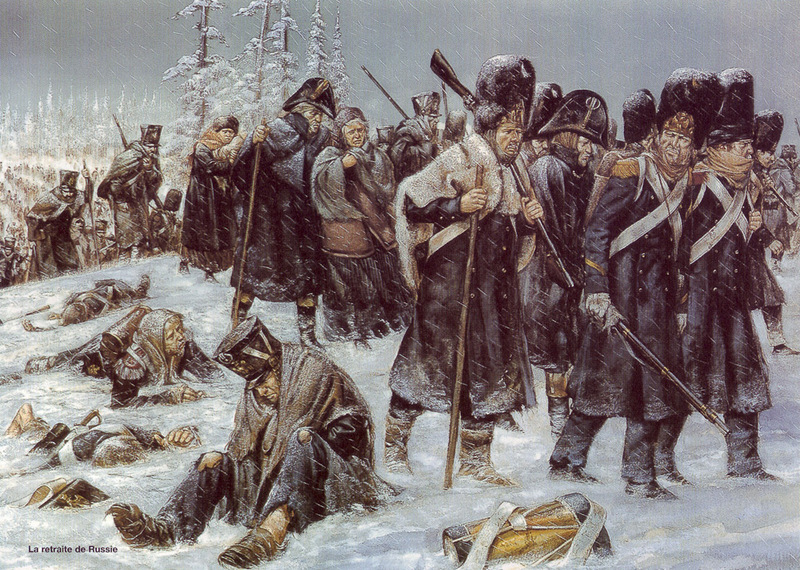 The retreating Russian army had stripped the countryside bare of resources and so first of all the French army were starved of food, then winter arrived with a vengeance. A combination of poor and inadequate food prevented the soldiers generating sufficient heat from within, and 40 degrees of frost, merciless winds and ineffective insulation removing body heat from the outside, decimated the army. Less than 20,000 men eventually returned to France, over 480,000 had perished. 130 years later, Hitler made the same mistake as Napoleon, after gaining a series of victories over the Russian army he pressed on to Moscow at the start of winter. The result was that 100,000 German soldiers suffered cold injury (about 10% of the whole army) in November and December 1941 resulting in around 15,000 amputations, and the German advance was halted. Cold doesn't have to be extreme to cause injury, another endemic peril of war - Trench Foot - is caused by standing for long periods in cold water and mud. The cold doesn't cause immediate injury or frost bite, but over a period of days or even longer can result in the amputation of feet and/or part of the leg. Trench foot is most associated with the First World War, but it also haunted the American Civil War, Korean War, Falklands Campaign and any conflict where it is cool, wet and the soldiers are not sufficiently protected from water and mud. With thanks to Morgan L. Anderson for editing suggestions.